Bitumen emulsion may have escaped from a crack in a Nexen pipeline for more than two weeks before a spill estimated at five million litres was discovered, a company official said Wednesday. The double-layered steel pipeline — a 16-inch pipe inside a 20-inch pipe — transports bitumen from Nexen’s Kinosis steam-assisted gravity drainage oilsands operation to its Long Lake facility. The buried pipeline had not been inspected since it was installed in 2014, said Ron Bailey, Nexen’s senior vice-president of Canadian operations. After operating for eight months, it was shut down in early June for cleaning with hot water before being returned to service June 29. A built-in leak-detection system failed to alert Nexen to the spill, which was discovered July 15 by a contractor walking the pipeline route. The break is in a muskeg area one kilometre south of the Long Lake facility, which is 36 km southeast of Fort McMurray. The Alberta Energy Regulator has issued an environmental protection order and is monitoring the cleanup effort. Alberta Energy Minister Marg McCuaig-Boyd said Wednesday she finds it “concerning” the leak may have been ongoing for weeks. Bailey and Nexen chief executive Fang Zhi were at the spill site Wednesday with reporters. Bird cannons fired randomly as Bailey and Fang spoke at the heavily secured site. The spill covers an area of about 16,000 square metres. A workforce of 130 people was using vacuum trucks and other machinery in the cleanup effort. Nexen’s focus is ensuring the safety of workers, minimizing effects on the environment and wildlife — one duck was found dead Sunday — and “understanding the root causes of this incident,” Fang said. Bailey had said Friday the pipeline rupture was in the shape of a “fish mouth,” but corrected that Wednesday. The crack, on the external pipe, is smaller than initially believed, he said. The internal pipe has not yet been examined. Bailey said Nexen believed the pipe-within-a-pipe design was safe for its “slightly unique” purpose — transporting bitumen emulsion “at temperature” 10 km from Kinosis to the Long Lake facility where it is upgraded. “Certainly, all the work was done to help us believe that we had a very good design here,” Bailey said. Nexen has shut in operations at Kinosis. The project had been producing 9,000 barrels per day. Production from other SAGD well pads at Long Lake may be stepped up, Bailey said. Nexen has not set a timeline for cleaning up the site. Bailey said cost is not an issue. The emulsion is estimated to be 66-per-cent produced water, 34-per-cent raw bitumen and sand. Produced water containing chlorides is a byproduct of the extraction process. Bailey said cleaning up the salty water is a bigger issue than the tar-like bitumen. He held a sample bottle of bitumen upside down to demonstrate its thick consistency. Nearby water bodies are being monitored for chlorides. The nearest small lake is about 80 metres from the edge of the spill site, and tests of its water have shown chloride levels of four parts per million, Bailey said. Other tests at the site have shown chloride levels as high as 2,000 parts per million, whereas potable water contains 500 parts per million, he said. Nexen was acquired by China’s state-owned CNOOC Ltd. in 2013. Bailey said construction on the pipeline wasn’t hurried after CNOOC’s takeover. CNOOC has put a renewed emphasis on safety, he said. The Alberta Energy Regulator has issued an environmental protection order to Nexen Energy after its pipeline spilled five million litres of bitumen and water south of Fort McMurray. A worker discovered the leak Wednesday while walking along the pipeline. The technology designed to detect leaks failed to alert the company of the pipeline break, the company said Friday. The protection order outlines the expectations [Why not mandatory requirements?] surrounding the remediation efforts, which include containing the spill, identifying and notifying affected parties and conducting testing in the area for hydrocarbons and chlorides. “It’s an extensive spill, so it’s going to take some time to clean up,” said Kim Blanchette, vice-president of public affairs for the AER, said Saturday. Once the investigation is complete, the AER will publish its findings. Because the spill is in an isolated area, Blanchette said Nexen is building a road to bring equipment to the site easily. In the past 24 hours, Nexen said the company has started fluid recovery, installation of a wildlife fence and installed effigies as bird deterrents. “There have been no wildlife impacts and we want to keep it that way,” Blanchette said. Nexen said the company will send personnel to the site to begin an environmental monitoring sampling program within the next 24 hours. — Develop a water body management plan, wildlife mitigation plan and detailed delineation and remediation plan. — Develop daily public reports and publish them online. — Submit a final report within 30 days of the completion of the work outlined in the order. Technology designed to detect leaks failed to alert Nexen of a pipeline break that spilled five million litres of bitumen and water south of Fort McMurray, the company said Friday. “We did have a contractor actually walking the pipeline and that’s how we discovered it,” said Ron Bailey, senior vice-president of Canadian operations for Nexen Energy ULC, which was acquired by China’s CNOOC Ltd. in 2013. The company is investigating why a warning system designed to detect ruptures did not work and how a double-walled pipe less than a year old broke, he said. After the worker found the break on Wednesday, which Bailey described as looking like a “fish mouth,” the high-pressure line was shut down and the Alberta Energy Regulator notified. The Long Lake Kinosis operation where the leak occurred was also shut down. The pipeline goes from Kinosis, a set of well pads drilled about 10 or 12 kilometres south of the Long Lake facility. The line transports the emulsion from that operation to Long Lake. The operation uses steam to heat up the oilsands bitumen deep underground, enabling it to flow to the surface. 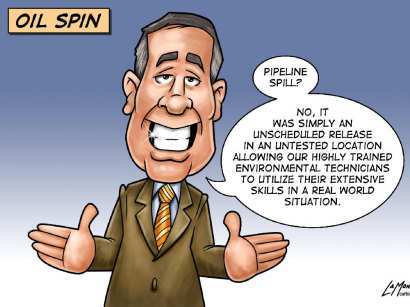 “We’ve walked the entire pipeline length looking for signs of any other leaks and there aren’t any,” Bailey said. The rupture occurred in a double-layered, 20-inch pipe that was laid in 2014, Bailey said. There have been no other incidents on that line, he added. The emulsion contained about 33 per cent bitumen. Water and materials such as sand make up the rest. The spill was mostly contained to the pipeline right of way by remaining berms left over from construction. The affected area includes muskeg. The spill, covering an area of about 16,000 square metres, has been “stabilized,” Bailey told reporters in the company’s first news conference since the spill was revealed on Thursday. It’s not known how long cleanup will take. Although a lake is situated about 100 metres from the pipeline, Bailey said there’s no immediate impact to it. Because of the remoteness of the site at Nexen’s Long Lake steam-assisted gravity drainage operation about 36 kilometres southeast of Fort McMurray, there was no immediate human impact, Bailey said. The closest aboriginal community of Anzac, part of Fort McMurray First Nation’s Reserve #176, 15 kilometres north of the spill, was notified, Bailey said. The statement from the community also stated that the First Nation community must be included “more directly” in the response. The spill site is accessible by winter-access road only so crews had to construct an all-weather road to reach the spill. “That’s taken us some time. We do have that now and we will be starting to vacuum here this morning to take up the spill,” Bailey said. Another road is being constructed directly to the break to bring in equipment. The company has hired pipeline spill response experts and is setting up equipment to keep wildlife away. Bailey promised a transparent response to the spill. “We are deeply concerned with this. I’d just say we sincerely apologize for the impact that this has caused. Melina Laboucan-Massimo, a Greenpeace campaigner, said Nexen’s spill is even bigger than the one in 2011 near her home community of Little Buffalo that spilled about 4.5 million litres into marshland when a Plains Midstream pipe ruptured. It was then the largest spill on an Energy Resources Conservation Board-regulated pipeline in Alberta in more than three decades. “It’s quite concerning that they don’t know what the root cause is or how long it was leaking even when companies have newly built pipelines,” she said. The Athabasca Chipewyan First Nation called the break a milestone in the oilsands. “It is now home to the largest spill in Canadian history,” the First Nation said in a release. “A spill this size into the muskeg, which is an important part of the eco-system and houses many of our medicines, berries and habitat for species our people rely on for sustenance, is extremely serious,” said Chief Allan Adam in the statement. The muskeg feeds into the groundwater system and the spill is dangerously close to the Clearwater River, he said. Alberta Energy Regulator (AER) staff are at the Nexen spill to assess the situation, investigate and ensure all safety and environmental requirements are met, the agency has said. Notley was in St. John’s, NL for a meeting of premiers and territorial leaders who agreed to a new national energy strategy when news of the spill broke. “What we need to do is have a rigorous and fulsome investigation into what went wrong here and ensure it is sufficiently rigorous that it can produce clear, meaningful recommendations to ensure that it doesn’t happen again,” she said. She said it was premature to talk about penalties and enforcement. The leaders’ agreement won’t force other provinces to automatically accept pipelines across their jurisdictions, but sets out the importance of the energy industry to all of Canada. While the Nexen break was bad timing and unfortunate, it didn’t alter the views of her fellow premiers that pipelines are still the safest way to transport hydrocarbon products, Notley said. Notley, who has raised concerns about the “conflicting mandates” of the AER, said she has confidence in the ability of the oilpatch watchdog to conduct a thorough investigation. “Going forward is there work that can be done to beef up the enforcement and environmental protection work that is done through the AER? Probably,” she said. Where is the AER’s (previously EUB/ERCB/AENV) Protection Order against Encana for breaking the law and fracing Rosebud’s drinking water aquifers now that the Water Act and AEPEA is under control of the AER? Or will none come with Ex-CAPP Chair, Ex-Encana/Cenovus Executive Gerard Protti as “conflict of interest” Chair of the AER? Where is the AER’s Protection Order to Encana to present a plan of “expectations” to repair the illegally frac’d aquifers, compensate the community for the near $700,000 cost to build a new water reservoir after the original water tower blew up in an explosion after Encana’s natural gas was released into the drinking water supply? 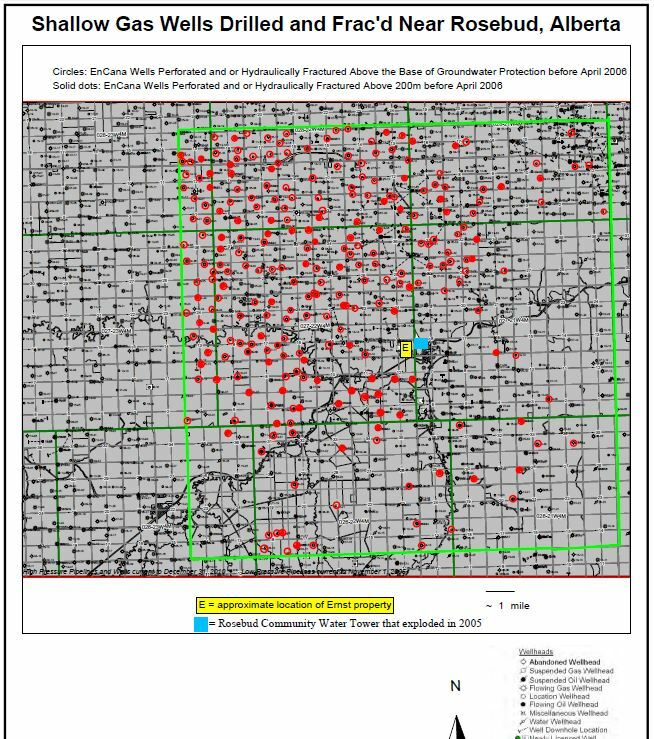 Where is the AER’s Protection Order to Encana to disclose all chemicals EnCana injected in the fresh water zones around Rosebud and continues to inject in already frac’d fresh water zones around Rosebud? Nexen Pipeline Spill: Where are apologies from Encana, Alberta government, AER for lying, covering-up Encana secretly fracing Rosbud’s drinking water aquifers, continuing to lie while children were being burned by the water after the community’s water tower exploded?